Planning to expand its base from French Louisiana, France took a bold step in 1685, planting its flag in eastern Texas near the Gulf Coast. Although claimed by Spain, most of Texas had no Spanish presence at all; the nearest Spanish settlements were hundreds of miles distant. French nobleman Rene Robert Cavelier, Sieur de la Salle, founded a colony called Fort St. Louis. But theeffort was doomed by a series of calamities: shipwreck, disease, famine,hostile Indians, and internal strife resulting in La Salle's murder by one of his own company. by 1690, France's bold claim to Texas had evaporated. 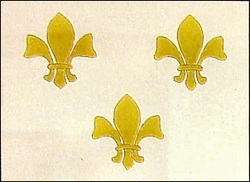 The French flag features a host of golden Fleurs-de-lis emblazoned on a field of white, which was actually the French royal ensign for ships and forts. For more than a decade after Mexico became independent, hardy pioneers from the Hispanic south and the Anglo north flowed into Texas. It was a frontier region for both; Anglo Texans became Mexican citizens. But divergent social and political attitudes began to alienate the two cultures. The final straw: Mexican General Santa Anna scrapped the Mexican federal constitution and declared himself dictator. Texans revolted and won their independence April 21,1836, on the battleground of San Jacinto near Houston. Mexico's intricate flag pictures an eagle, a snake (an image from pre-Columbian mythology) and cactus on bars of brilliant green, white and red. During nearly ten years of independence, the Texas republic endured epidemics, financial crises and still-volatile clashes with Mexico. But it was during this period that unique accents of the Texas heritage germinated. Texas became the birthplace of the American cowboy; Texas Rangers were the first to use Sam Colt's remarkable six-shooters; Sam Houston became an American ideal of rugged individualism. Texas joined the United States on December 29,1845. The red, white and blue Texas state flag with its lone star (the same flag adopted by the republic in 1839) today flies virtually everywhere: on government buildings, schools, banks, shopping malls, and even on oil derricks.